Wounded Warrior Project® empowers veterans with the knowledge of identifying what prompts emotional eating so they can make healthier decisions for better mental health and wellness. We’ve all been driven by emotion to eat. Too many times a bag of chips, a pint of ice cream, or a pizza become responses to changes in mood. Veterans know hunger pains that originate in the brain, not the stomach, are a burden on physical and mental health since they result in unnecessary calories and guilt. It becomes a relentless cycle: anxiety and depression lead to the instant pleasure of food, pleasure develops into relief, relief becomes regret, and regret revolves back into anxiety and depression. And the cycle repeats. 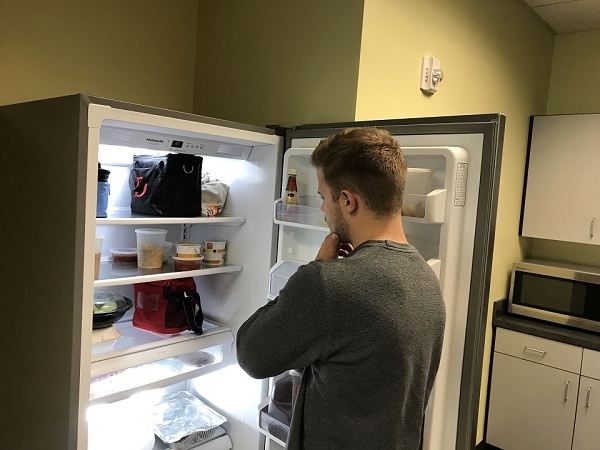 Wounded Warrior Project® (WWP) empowers veterans with the knowledge of identifying what prompts emotional eating so they can make healthier decisions for better mental health and wellness. Understanding why we eat helps us manage the underlying reasons that affect our behavior. To understand emotional eating, it’s important to know why we eat. Often it becomes a coping method for immediate gratification when feeling bored, happy, sad, lonely, or ashamed. Knowing the difference between physical and emotional hunger, understanding cravings, and addressing A-B-C-D triggers are important ways to gain control of your appetite. Physical hunger is based in the stomach. It’s a gradual sensation that’s open to different kinds of foods. It occurs out of physical need and involves deliberate choices with an awareness of eating. People who are physically hungry understand eating is necessary, and they usually stop when they’re full. Emotional hunger is based in the brain. It’s sudden and usually targets a specific food like ice cream or chocolate. The hunger pains are urgent and paired with an upsetting emotion. It involves automatic or absent-minded eating that doesn’t stop when the stomach is full, which can lead to guilt and depression. Using smell, sight, touch, sound, and taste are ways to be aware of emotional eating. It is easy to be tempted by a sense that reawakens a memory. Whether it is seeing steam from a fresh-baked pie or hearing popcorn popping, all can be triggers for emotional eating. Nutritionists know cravings are identified in three ways – mouth-feel, sound, and taste. Smooth, soft, creamy, crunchy, and crispy are examples of mouth-feel and texture. Crunchy and crispy sounds amplify through the jawbone and often distract the brain from what’s being consumed. Taste is based on salty, sweet, bitter, spicy, and savory flavors. Emotional eating often happens when you’re not hungry. It’s possible to eat too much or eat unhealthy things. It could involve skipping meals early in the day, only to over-eat at night. It’s important to recognize the triggers of emotional eating. Creating a food journal is a great way to track eating habits. In addition to listing everything you consume, it’s equally important to write down your feelings before, during, and after each meal or snack. According to WWP’s Physical Health and Wellness program, learning why our brains tell us to eat is as easy as A-B-C-D.
A is for activity. What was I doing that triggered my behavior? Who was I with? What happened to make me feel this way? B is for beliefs. What was I thinking about? What changed my mood? C is for consequences. What did I feel? What were my urges? And D is for disputing logical reasoning. Create a positive reaction instead of a negative one, and choose an action that has better consequences and greater balance. So what do we do when we find those triggers? Try doing what makes you happy. Listen to music. Take a walk. Work out. Go dancing. Clean the house. Move to another room. Make another entry in your journal. Eating should satisfy your body’s need for nutrition. By allowing your stomach, not your brain, to tell you when you’re hungry, you can avoid the unhealthy enticement of emotional eating. Registering with WWP is a good way for veterans to stay on a healthy path, with access to program events that include adaptive sports, nutrition coaching, and recreational activities. To learn about how WWP's Physical Health and Wellness program is helping warriors, visit https://www.woundedwarriorproject.org/programs/physical-health-wellness.